As much as I try not to haul a bunch of stuff with me to the beach, I am never successful at “traveling light” when I’m beach bound. 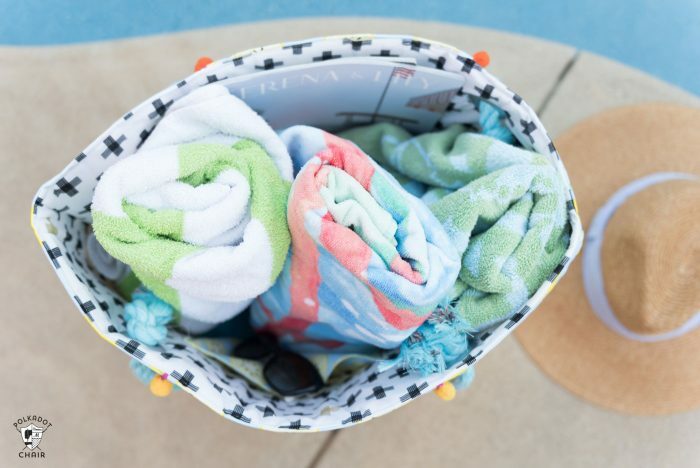 There are just too many things that I like to take with me to the beach or the pool. 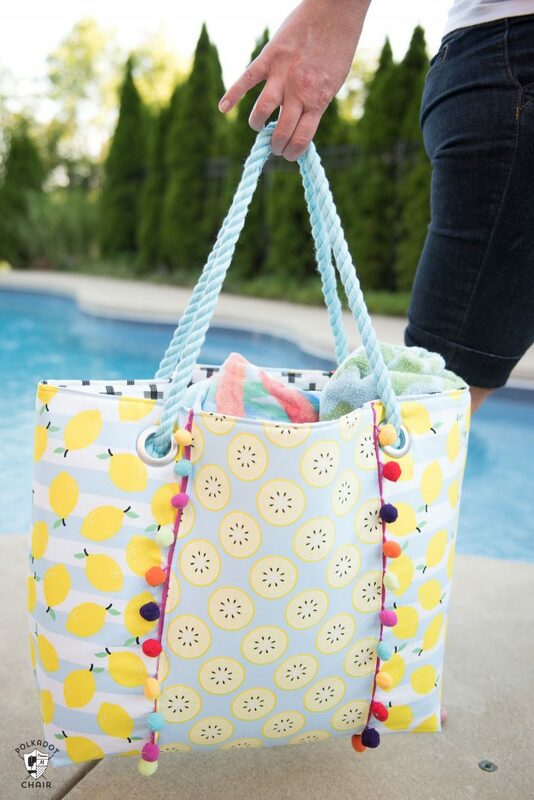 The Oversized Beach Bag Sewing pattern that I am going to share with you today has PLENTY of room for all of your pool or beach necessities! 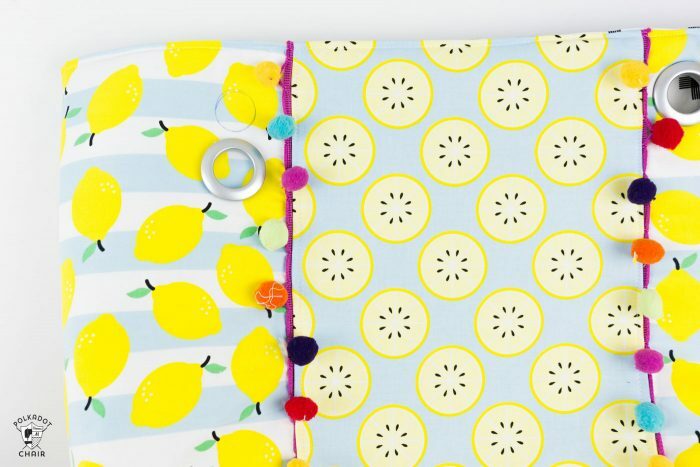 If you like this project then you may also like this Splash Proof Phone Pouch Sewing Tutorial. 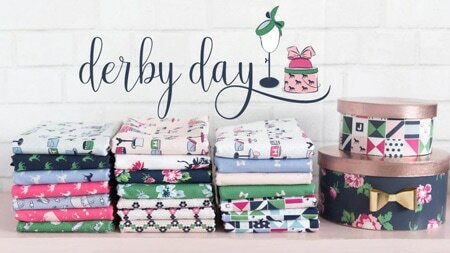 Today I’m excited to be participating in the blog tour for Simple Simon and Co.’s newest fabric line, Just Add Sugar. 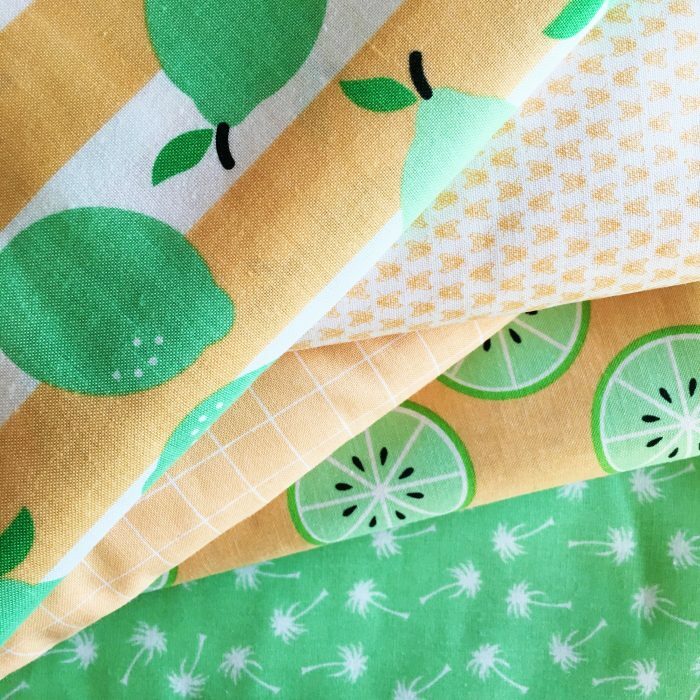 The line is manufactured by Riley Blake Designs and is absolutely perfect for summer! 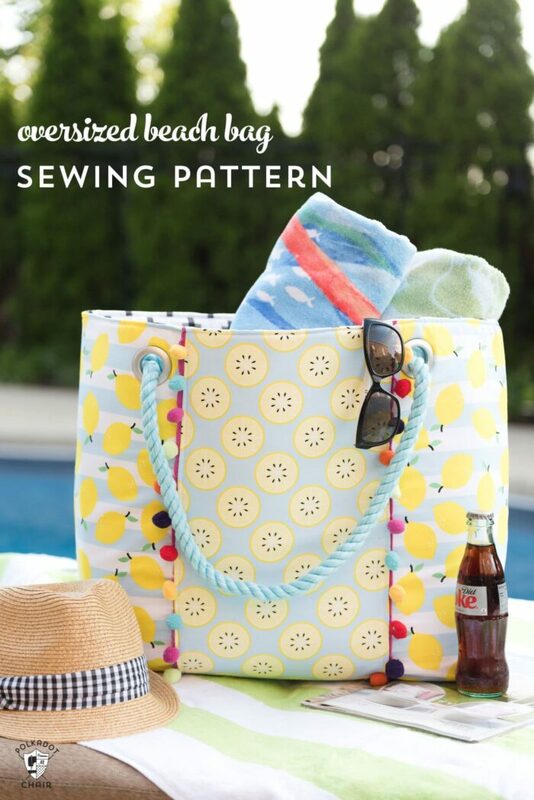 As soon as I spotted the line I KNEW that someone needed to make a beach bag out of the fabric. 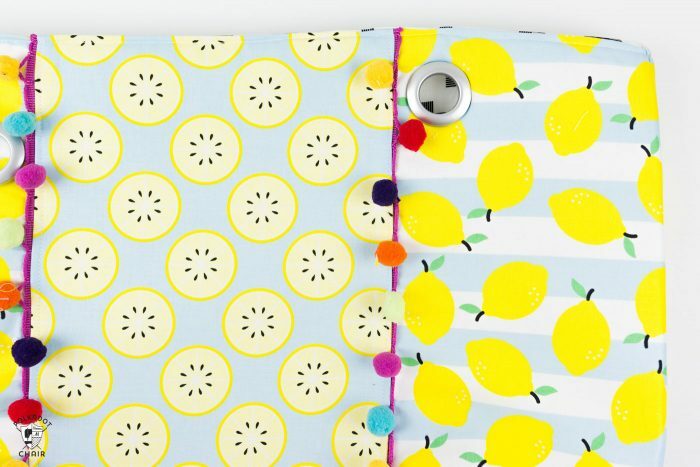 I mean how can you resist with all of those fun lemons and bright colors? The line comes in 3 fun colorways. There is the Blue and Yellow pictured in my bag and in the photos below. 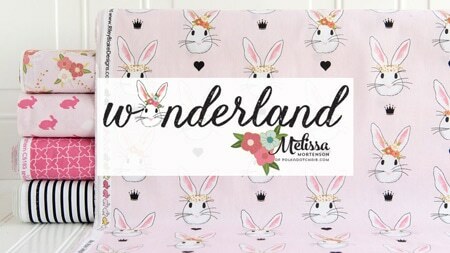 A fun bright pink colorway. 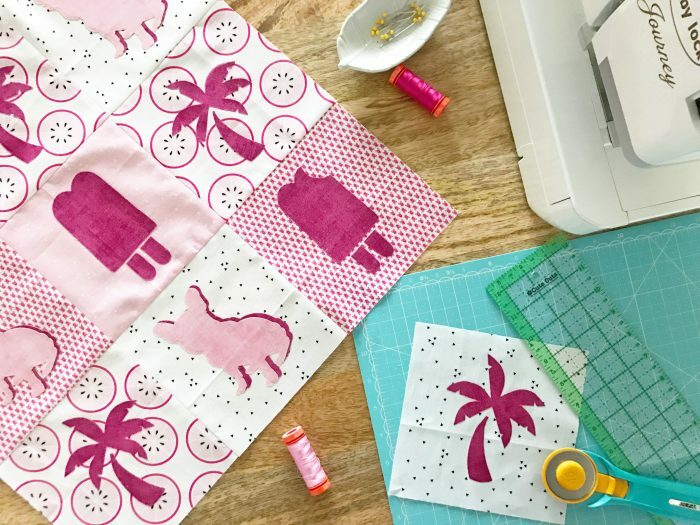 Christopher of the Tattooed Quilter made this ADORABLE mini quilt using some of the pinks in the line! 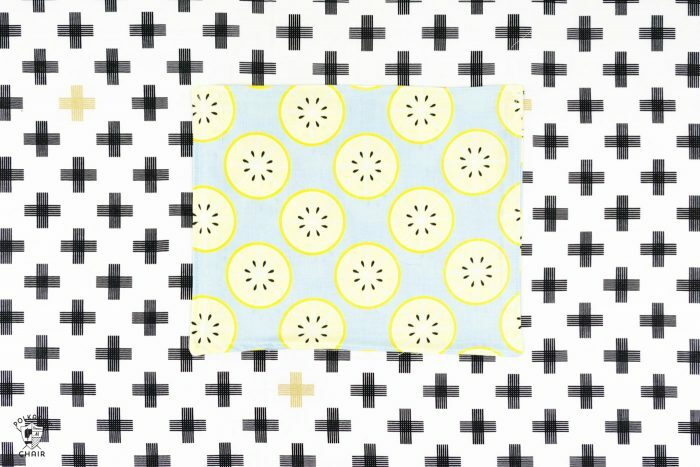 (you can read more about the fun quilt on his blog by clicking here). There is also a great green and peach color version. 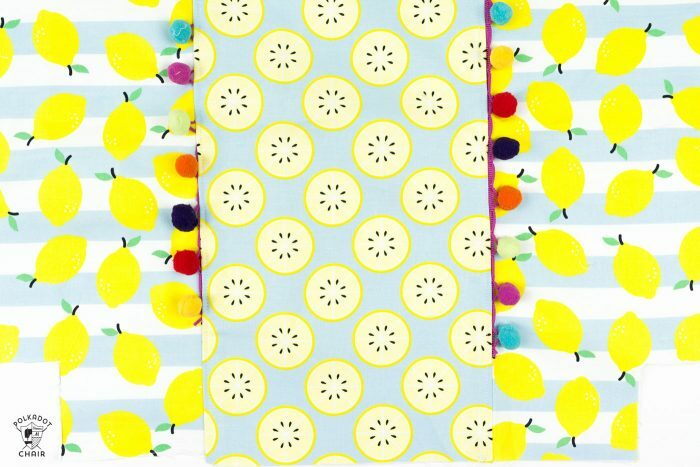 Normally I would have jumped right for the bright pink fabric but thought I’d “step away from the pink” for a bit and sew with the fun blue and yellow instead. I decided to design an oversized beach bag. 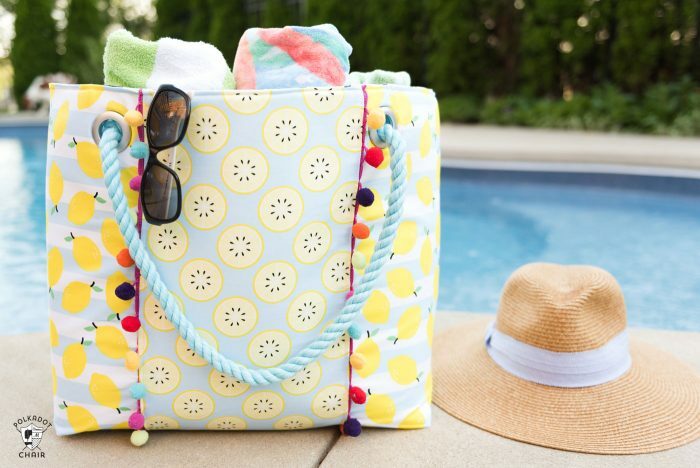 I love to have bags that are large enough for me to tote all of my supplies to the beach, lake or pool with me. There is nothing worse than making a million trips back to your car to get all of your stuff. 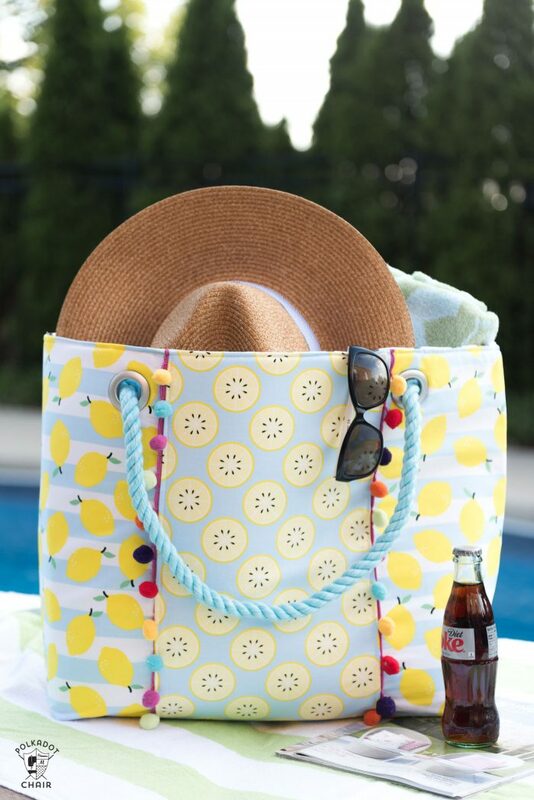 The bag features one small interior pocket for your phone or sunglasses. I did not include any other pockets. It has been my experience that large pockets are just places to lose things and I’d prefer instead to load the bag with smaller zip pouches that are easier to find. 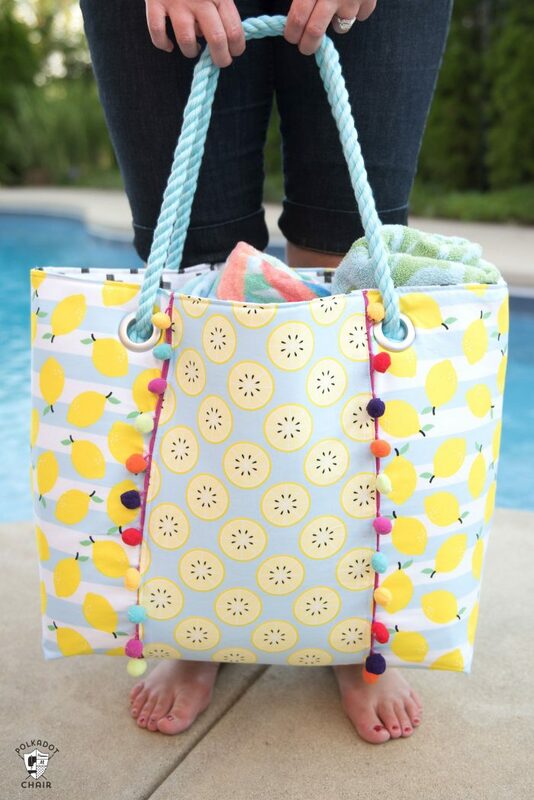 The bag features some fun cotton rope handles too! 3 yards of 1/2 cotton rope – I purchased my rope HERE. Bag Lining Fabric is cut at a later point. Iron Shape flex interfacing onto the wrong side of the bag center and bag side pieces. Refer to the directions on the package for pressing instructions. On two of the bag side pieces cut a 3” x 3” square from the bottom right corner. On the other two bag side pieces cut a 3” x 3” square from the bottom left corner. Pair one bag side piece cut from the right corner with one bag side piece cut from the left corner. Repeat. Pin Pom Pom trim to the long side of the bag side piece (on the side without the square-cut out). 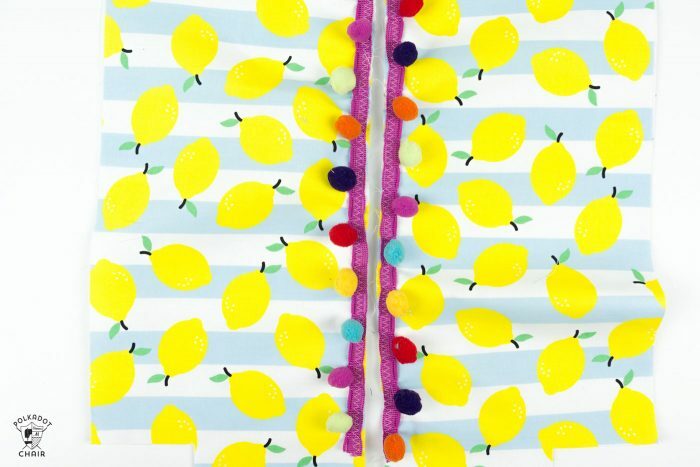 The edge of the Pom Pom trim should be flush with the raw edge of the fabric. Using a zig-zag stitch attach pom pom trim to the bag side piece. 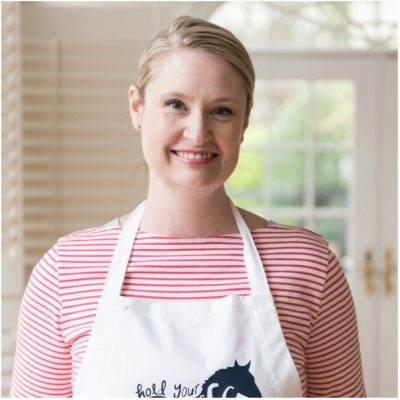 Stop the pom pom trim 3″ from the bottom of the piece. Repeat for other 3 bag side pieces. Pin two bag side pieces right sides facing to the bag front piece along the long edge. 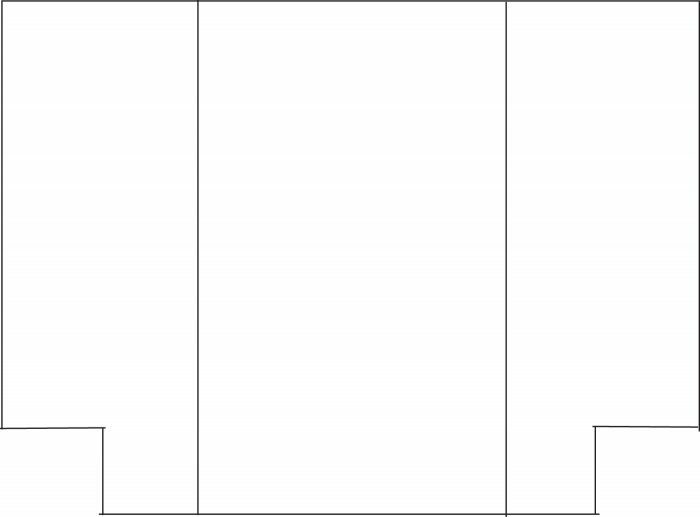 The cut-out corner will be on the outside (this is why you need a right and a left bag side pieces). 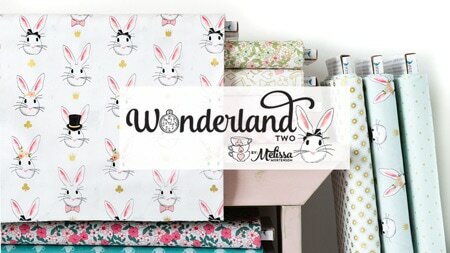 Stitch with a 5/8″ seam allowance. Press seam towards the bag center pieces. Top stitch along the seam between the bag center and bag side pieces. Repeat with other bag side/ bag center pieces to create the bag outside back piece. Fold the bag pocket piece in half right sides facing. Stitch around 3 sides of the pocket leaving 2″ -3″ opening on one side of the pocket so you can turn it right side out. Clip corners, turn right side out and press. Top stitch one of the long sides – this will be the top of your pocket. Using one of your bag outside pieces as a guide, cut 2 bag lining pieces and 2 pieces from fusible flex foam. Trim 1/2″ off the top of each piece of flex foam. Press the fusible flex foam onto the wrong side of the bag lining pieces. You should have 1/2″ of fabric hanging over the edge of the flex foam at the top. Pin the pocket to one of the bag lining pieces in the center of the lining and a few inches down from the top edge of the lining. Stitch around 3 sides of the pocket to secure. Make sure you back-stitch. Pin the two bag outside pieces together, right sides facing. Stitch the center and bottom seams using a 1/2″ seam allowance. 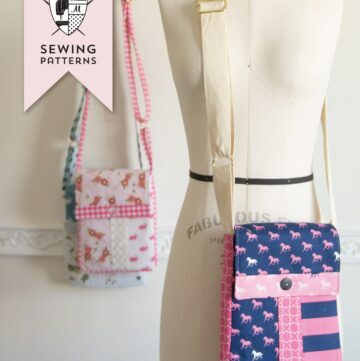 Pinch one of the bottom corners of the bag so that the side and bottom seams are on top of each other and stitch using a 1/2″ seam allowance. Repeat for other bottom corner. Stitch the bag lining pieces together just as you did for the bag outside pieces. Trim the seam allowances down to 1/4″ to reduce bulk. Turn bag lining piece so that the right side of the fabric is facing out. Slip the bag lining piece into the bag outside piece, right sides facing. 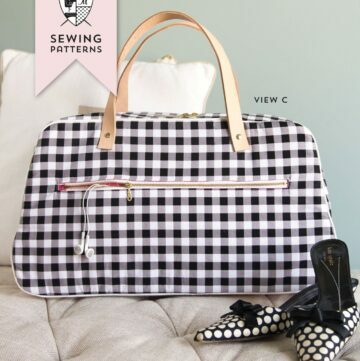 Make sure that you match the bag centers and side seams. Pin well. Stitch along the top edge of the bag 1/2″ down from the raw edge of the fabric. You will be stitching right up to the edge of the flex foam interfacing. Leave a 9″ opening on one side of the bag so that you can turn the bag right side out. Turn bag right side out. Press top seam well, making sure to catch the opening that you used to turn the bag right side out and press. Top stitch along the top of the bag. Following the directions on the package of grommets attach 2 grommets to each side of the bag 1″ down from the top edge of the bag and just over from the seam between the bag center and bag side pieces. Cut your rope to your desired length. Before you cut wrap a piece of masking tape around the end of the rope so it does not unravel while you are working with it. I cut my rope pieces to 40″ long. Feed rope through the hole in the grommet and tie a knot. After you have the rope in the location that you want, remove the masking tape from the end of the rope and allow it to fray up to the knot. Give the bag a good pressing and you’re done! How to Make a Metal Frame Purse. 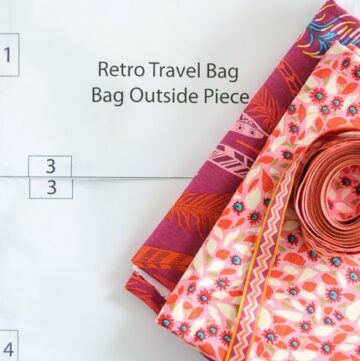 Retro Weekender Travel Bag Pattern. 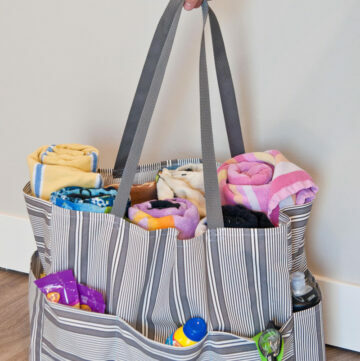 Must Know Bag Making Tips & Tricks. What color is the cotton rope in the picture? Aqua or sky blue? The bag is darling. I’m looking through my stash now. I cannot sew, but I love this you made. Beautiful! 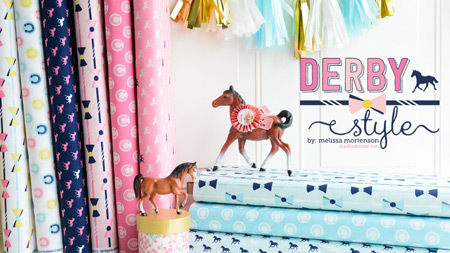 So cute I can’t wait to make one! I just purchased the rope! Any idea the finished dimensions? I may adjust it for my daughter. Thanks! I might try this, since the end result looks way too amazing and so suitable during Summer. Love the bag! What are the approximate final dimensions of the bag? Such a beautiful bag..Making it to gift my teacher friend who requested an oversize tote to take to work. How much weight do you think this will hold with the grommets? I’ve had trouble with grommets pulling out when I use a bag as a purse, catch-all – wallet, multiple keys, water bottle, etc.. I honestly don’t know. I haven’t had any issues carrying basic supplies. You need to make sure you buy heavy duty grommets, like the ones for drapes. They will hold up bettern. Cute bag! Is there a difference between the flex foam and the Shape Flex Interfacing? I made this bag and love it but now I am getting ready to put the grommets in and was wondering if you took the serger around the holes or left them? Just a little nervous about the material fraying. No, I just cut it out. No problems with fraying! 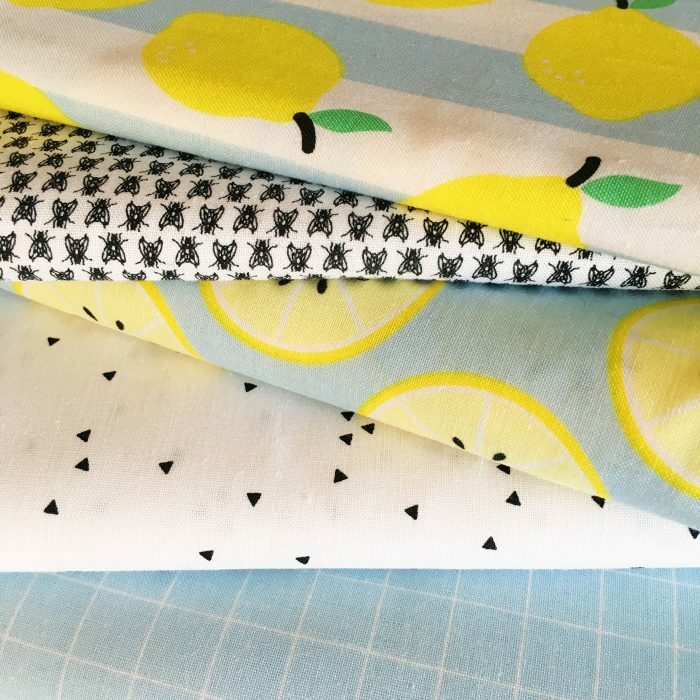 I may of missed it, but do you use regular cotton fabric or a heavier material?